We had been hoping for a fine day on 2nd July 2018 for our Heritage Walk, but we did not expect the heat that we encountered! The Church Barn was pleasantly cool and it provided a welcome venue to discuss Biddenham 100 Years Ago and the men who died during the First World War. We also enjoyed refreshments there after our walk. In 1918, Biddenham was a much smaller community (451 inhabitants in the 1911 census). The Church Barn was a real barn, part of a thriving farm, Church Farm, tenanted by Bobby Whitworth. The wheat and barley grown on the farm were stored in the barn and the barley was sent to Charles Wells brewery in Horne Lane, Bedford after it had been threshed. We know from Ted Pile’s memoirs that he had been sent to the Saunderson Works in 1916 to learn how to drive and repair a tractor, and with the shortage of men and horses as a result of World War One, tractors were being used on Church Farm. As we walked from the Barn to the Coffin Path, we noted that the new churchyard would not have been there in 1918. The Cedar of Lebanon trees in the main churchyard were much smaller and there was no vestry attached to the church. One member of our group remembered that his grandparents were married in the church in 1910. The Coffin Path was there in 1918, as it was the main way of taking the coffins of the deceased from the cottages to the churchyard for burial. Looking across from the Coffin Path, there would have been more cottages near the church in 1918. Three cottages attached to 55, Church End, Church Cottage, were burnt down in 1959. We admired the view of 17, Church End, White Cottage, which was finished in 1909 and must have been very new and smart looking in 1918. Before we reached the pond, we noted that the dovecote would have been there in 1918 as well as the pond. The area around the pond provided shade and seating and we decided to talk about the War Memorial area there, as there was no shade by the War Memorial. Dawn Cottage was home to the Shaw family. In 1918, Robert Shaw was serving with the Royal Veterinary Corps in the Middle East. His wife, Alice, was waiting for news of him, but he did return safely. The Davison family, who lived at the Smithy on the Green, were not so fortunate. The blacksmith, Bill Davison’s son, John, died of wounds on 8 th June 1918 whilst serving in France with the 6 th battalion of the Machine Gun Corps. 1918 was a difficult year for those living in the village. There was uncertainty about those serving in the forces – would they come home? Some were prisoners of war and money was raised to get them adequate help. Private Ernest Smith was in hospital in Darmstadt, Germany with a bullet wound in his foot and ankle. By the cessation of hostilities in November, 1918, 9 men with Biddenham connections had been killed or died later of their wounds: Thomas Riddy, James Plain, Giles Havergal Shaw, Alfred Dudley, Wilfred Herring, Algermon Armstrong, Richard Wright, John Davison and Greville Shaw. A tenth man, Walter Rowney, was to die of his wounds in January, 1919, before he could come home. All these men had relatives who wanted their loved ones to be commemorated on the new War Memorial when it was unveiled in 1922. Other men from Biddenham returned home as can be seen on the photograph taken in 1919 of those who had served in the forces. Several suffered from the effects of their wounds for the rest of their lives: Willie Dowler for example, lost his right arm and his right eye. Thomas Riddy’s widow had to bring up three daughters and earn her living teaching at the Village School. 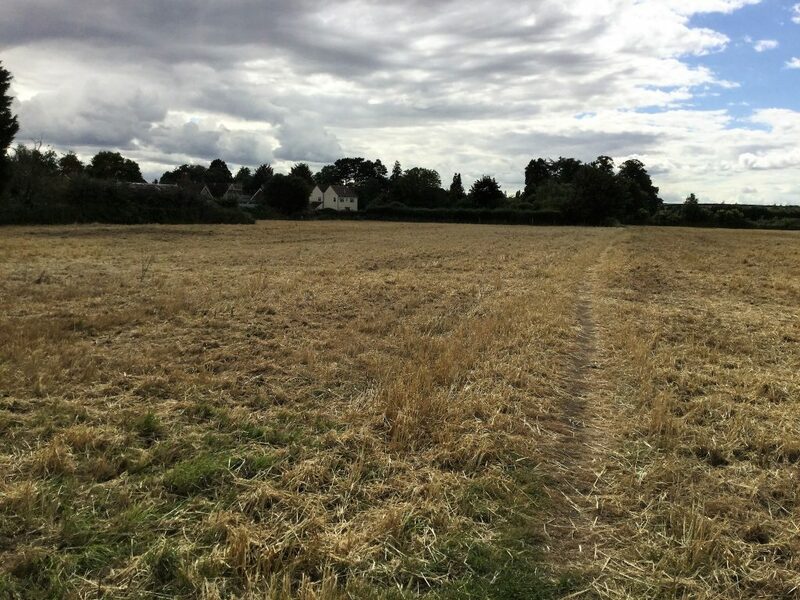 Before and during our walk, by looking at the buildings and through discussion, we realized how much Biddenham was affected by the First World War and the social and economic changes it brought about. The next meeting of the Biddenham History Society will be on Monday 19th November, 2018 at 8pm in the Church Barn. Amanda Goody who is one of the Bedford Town Guides will talk to us about Margery Fish – Cottage Garden. We have many lovely cottage gardens in Biddenham and this talk will give us their historical background and perhaps provide some inspiration! I hope you will be able to come.